Learn more about Pediatric Radiology by reading through some of our additional Pediatric Radiology pages and resources. We believe that children aren’t just little adults. They have medical needs that often require a specialty trained care provider. That’s why we have a team of dedicated pediatric radiologists who care for our youngest patients. These imaging specialists have unmatched access to equipment, technologies and support staff at the area’s only pediatric outpatient imaging center. Learn more about Wake Radiology’s commitment to pediatric radiology by watching this interview with Dr. Brent Townsend, a pediatric radiologist. How is a pediatric radiologist different from another type of imaging specialist? All board certified radiologists have an additional four or five years of radiology training after medical school. Many of the doctors at Wake Radiology completed an additional year or so of specialty training, for example, pediatric radiology. This helps our pediatric imaging specialists more accurately diagnose the subtle differences that are part of a child’s anatomy. We’re more attuned to the nuances of their growing bodies. Does the pediatric office have special imaging equipment? We do approach imaging differently at Wake Radiology’s dedicated pediatric outpatient facility. The first thing children and parents notice is that the office environment is bright, colorful and kid-friendly. We have different waiting areas for well and sick children, too. We also spend a lot of time talking with parents about a child’s needs and discussing their imaging options to make sure we identify the best procedure for the patient. Parents are often concerned about radiation exposure. How does Wake Radiology help limit radiation exposure during pediatric exams? There is a lot of discussion about radiation and children in the news media. The one thing that we agree with is that radiation does have risks. We always do our best to limit radiation exposure in all patients, especially children. We talk with parents about the risks of radiation versus the benefit of information gained from a procedure. There are also two valuable procedures that don’t use any radiation and deliver quality images especially in children – ultrasound and MRI. We try to use these whenever possible. If a CAT or CT scan is needed, we adjust the radiation dose to the patient and only image the smallest area medically necessary to get a diagnosis. 4301 Lake Boone Trail, Suite 100 Raleigh, NC 27607 The Wake Radiology outpatient Pediatric Imaging Center in West Raleigh is the first – and only – in the Triangle. It was designed to meet the needs of children from newborn to age 18 and is one of only a handful of its kind in the country. Our child-friendly 2,300 square foot facility has separate well-child and sick-child waiting rooms that are decorated with colorful murals. It also features three private “quiet rooms” that families use to calm their sick or anxious children. Parents can also use these rooms for feeding and changing their children, and for private consultations with our pediatric radiologists. 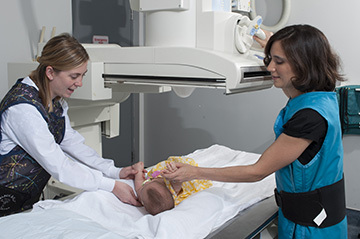 Wake Radiology pediatric radiologists and technologists are skilled in handling children. They are experts at getting children to hold still using age-appropriate distraction and coping techniques. This allows us to get high-quality studies done quickly, which reduces the amount of stress on both the child and caregivers, and decreases the number of repeat exams. Our radiologists get directly involved in almost every case at our West Raleigh office. This hands-on approach allows us to tailor exams for every patient and increase diagnostic accuracy. The office is located in the medical neighborhood surrounding Rex Hospital, and a pediatric radiologist is on-site Monday-Friday from 8:00am -5:00pm. During the work week, parents can also bring their children to most of our other outpatient offices for routine examinations. Images taken at these locations are immediately sent electronically for interpretation by one of our pediatric radiologists at the Pediatric Imaging Center. On Saturday, parents can bring their children to our Cary and Garner locations to have the imaging study taken “closer to home.” When a child needs a non-urgent study, parents who want to be present for the procedure (but can’t get off of work) really like this option. Magnetic resonance studies (MRI) are performed seven days a week at our Cary office and Monday-Saturday at our Raleigh MRI office. When appropriate, a pediatric radiologist collaborates with our MR radiologists on the interpretation. Our pediatric radiologists not only interpret imaging studies taken at all Wake Radiology outpatient locations, but they are also on staff at WakeMed hospitals. This approach delivers an important level of imaging continuity that improves the care provided by the area’s pediatric community and its increasing number of pediatric subspecialists.